Asbestos survey and management services available from CERL range from building/home inspections, air monitoring, abatement oversight (on-site QA) and final cleanance inspections and sampling. CERL personnel have completed several thousand such project in a wide variety of structure types for both public and private clients. CERL personnel can provide consultation regarding compliance with such regulations as those pursuant to AHERA, NESHAPs, DOT and OSHA. Asbestos is a naturally occurring family of fibrous mineral substances. 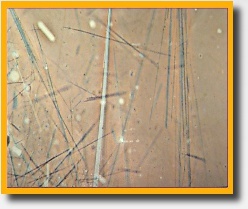 The typical size of asbestos fibers that constitute a health hazard is 0.1 to 10 microns in length, a size that is not generally visible to the human eye. When disturbed, asbestos fibers may become suspended in the air for many hours, thus increasing the extent of asbestos exposure for individuals within the area. EPA regulations identify the following types of asbestos: chrysotile, amosite, crocidolite, anthophyllite, actinolite, and tremolite. Approximately 95 percent of all asbestos used in commercial products is chrysotile. Asbestos became a popular commercial product because it is noncombustible, resistant to corrosion, has a high tensile strength, and a low electrical conductivity. However, asbestos had very little use until the early 1900s. Since then, asbestos fibers have been mixed with various types of binding materials to create an estimated 3,000 different commercial building products. Asbestos has been used in brake linings, floor tile, sealants, plastics, cement pipe, cement sheet, paper products, textile products, and insulation. The amount of asbestos contained in these products varies significantly, from <1 percent to 100 percent, depending on the particular use. The potential of an asbestos-containing product to release fibers is dependent upon its degree of friability. Friable means that the material can be crushed, crumbled, or reduced to powder by hand pressure and, therefore, is likely to emit fibers. The fibrous or fluffy spray-applied asbestos materials found in many buildings for fire-proofing, insulating, sound proofing, or decorative purposes are generally considered friable. 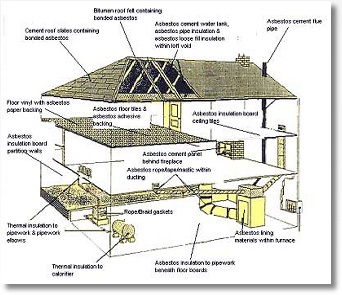 Asbestos containing pipe and boiler insulation are also friable and found in numerous buildings. Some materials, such as vinyl-asbestos floor tile and asphalt based materials, are considered non-friable and generally do not emit airborne fibers unless subjected to sanding, grinding or sawing operations. Other materials, such as asbestos cement sheet and pipe, can emit asbestos fibers if the materials are subjected to breakage or crushing in the demolition of structures that contain such materials. Medical studies of asbestos-related diseases have revealed that the primary exposure route is inhalation. The exposure may be classified as "occupational exposure" of workers involved, for example, in mining, milling, manufacturing, fabricating, construction, spraying, or demolition activities; "para-occupational exposure" of workers' families due to asbestos on work clothes taken home; or "neighborhood exposure" of people living or working near such operations. The following diseases can result from inhalation of airborne asbestos fibers. Asbestosis - A non-cancerous respiratory disease that consists of scarring of lung tissues. Symptoms of asbestosis include shortness of breath and rales, a dry crackling sound in the lungs during inhalation. Advanced asbestosis may produce cardiac failure and death. Asbestosis is rarely caused by incidental exposure. Lung Cancer - Inhaled asbestos particles can produce lung cancer independent of the onset of asbestosis. In most lung cancer patients, a cough or a change in cough habit is found. A persistent chest pain unrelated to coughing is the second most common symptom. Mesothelioma - This is a rare cancer of the thin membrane lining of the chest and abdomen. Most incidences of mesothelioma have been traced directly to a history of asbestos exposure. The earlier in life that one begins inhaling asbestos, the higher the likelihood of developing mesothelioma in later life. The common symptoms are shortness of breath, pain in the walls of the chest, or abdominal pain. Mesothelioma is always fatal. EPA has major responsibility for regulatory control over exposure to asbestos. Emissions of asbestos to the ambient air are controlled under Section 112 of the Clean Air Act, which establishes the National Emission Standards for Hazardous Air Pollutants (NESHAPs). The regulations specify control requirements for most asbestos emissions, including work practices to be followed to minimize the release of asbestos fibers during handling of asbestos waste materials. This regulation also requires written notification of the project to the controlling authority (federal, state or city) a minimum of ten (10) days prior to the start of the project. EPA has implemented a separate regulation under the Toxic Substances Control Act (TSCA) to handle the problem of asbestos construction materials used in schools. This regulation, under the Asbestos Hazard Emergency Response Act (AHERA), requires that all schools be inspected to determine the presence and quantity of asbestos and that the local community be notified, as well as posting the asbestos in the building. (Note: the training requirements found in the AHERA regulations have been extended to asbestos related work in all ‘public buildings' which includes multiple family housing of quadraplex and larger). The OSHA regulations are established to protect workers handling asbestos or asbestos-containing products. The current OSHA regulations include a maximum workplace airborne asbestos concentration limit of 0.1 fibers/cc on an 8-hour time weighted average basis. The standard includes requirements for respiratory protection and other safety equipment, and work practices to reduce indoor dust levels. Other federal authorities and agencies controlling asbestos include: the Clean Water Act, the Mine Safety and Health Administration, the Consumer Product Safety Commission; the Food and Drug Administration; and the Department of Transportation. Many states have adopted regulations identical to the federal agencies and/or have developed programs to assume implementation and enforcement of those regulations within the states authority.